Speaking on behalf of the participants, Mahlon Houkarawa, says that the grassroots course has opened their eyes to the world of coaching and that the sessions were very rewarding. “We learned a lot from this course and we commit ourselves to carrying the grassroots message to our communities. We have also developed networks within this course that will help us to share experiences and improve ourselves,” Houkarawa says. The 5-day course ended with a sense of ambition amongst the coaches who held a meeting immediately after the closing ceremony to discuss how each one can carry out their activity plans in their schools and communities. The participants also discussed a monitoring scheme whereby SIFF can follow up and support their work. The participants also left with a message from the SIFF president, Martin Alufurai, calling for greater commitment at the grassroots level in Solomon Islands. “Through grassroots football we have the opportunity to develop our next top footballers. We did not have such a tool at our disposal in the past but today FIFA is empowering passionate people like you to assist in developing our young players. Without grassroots development any sport can completely die because there is continuity of players,” Alufurai says. Alufurai also reiterated SIFF’s commitment to developing infrastructure throughout Solomon Islands to strengthen football development. “Technical training alone cannot develop football that is why SIFF has a vibrant plan to develop facilities in all our provinces. This will give you coaches the environment to practice and improve your skills our players the avenue to compete,” Alufurai says. The twenty-seven participants in the course underwent an intensive 5 days of training that started on Monday. The course basically introduces the methods of coaching for 6-12 year old footballers and also covers the management aspects of running a football education program for young players. One of the highlights of the course was the football festival segment which involved more than 80 children from schools and communities in Honiara that took place yesterday where the participants put to practice the knowledge they gathered from the course. The course was conducted by OFC head of education and training, Didier Chambaron, and Daniel Shirley who is the OFC player development officer. 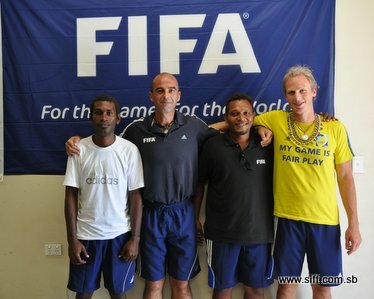 The course was funded by FIFA under its international grassroots outreach program.